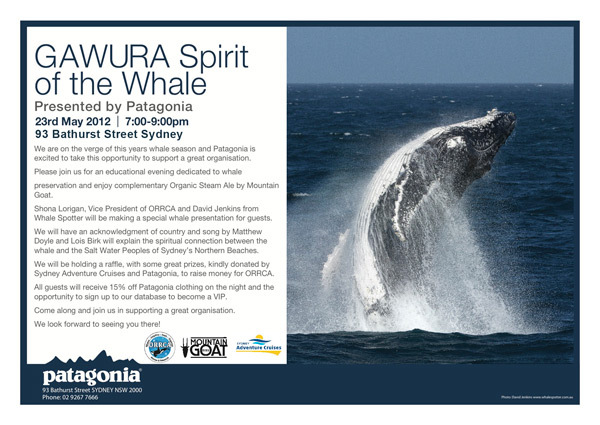 Come and celebrate the launch of the 2012 whale watching season and learn more about these magnificent animals. We will have an acknowledgment of country and whale song by Matthew Doyle and Lois Birk will explain the spiritual connection between the whale and the Salt Water Peoples of Sydney’s Northern Beaches. Shona Lorigan, Vice President of ORRCA and David Jenkins from Whale Spotter will be making a special whale presentation for guests. There will be a fund raiser raffle for ORRCA with great prizes from Patagonia, Sydney Adventure Cruises and Whale Spotter.